Thromboembolism an extra intestinal manifestation of inflammatory bowel disease (IBD)? Could thromboembolism be considered an extra intestinal manifestation of inflammatory bowel disease (IBD)? Reference: Solem CA, Loftus EV, Tremaine WJ, Sandborn WJ. Venous thromboembolism in inflammatory bowel disease. Am J Gastroenterol. 2004 Jan;99(1):97-101. IBD refers to two chronic diseases that cause inflammation of the intestines: ulcerative colitis (UC) and Crohn's disease (CD). Patients suffering from IBD have a three-fold increased risk of venous thrombosis compared with matched controls. Importantly, thromboembolic disease is a significant cause of morbidity and mortality in patients with IBD. The results of this retrospective study confirm that the IBD cohort compared to the general population had, in fact, a significantly increased rate of venous thromboembolism (VTE). 98 cases of IBD, 59 UC patients and 39 CD patients (identified between 1991 and 2001 at Mayo Clinic Rochester) who had developed a deep venous thrombosis (DVT) and/or a pulmonary embolism (PE) were analyzed. The results suggested that the extent and activity of the IBD are highly associated with thromboembolic risk. The authors, despite a very limited observational experience, suggest that colectomy per se is not protective from recurrent thrombembolic disease and that VTE is not an indication for an invasive procedure, particularly in UC patients. However, the exact mechanism explaining the initiation of thrombosis remains unclear. It is likely to be a multifactorial process. Reported abnormalities include activation of markers of the coagulation cascade, disturbed fibrinolysis, and the activation of platelets. The contribution of thrombophilic disorders such as factor V Leiden, prothrombin gene mutations, and hyperhomocysteinaemia are discussed, but their role in thrombosis associated with IBD has remained unclear. Nevertheless, patients suffering from this condition are often exposed to high-risk situations such as hospitalization, immobilization, or invasive procedures. Even if long term anticoagulation is contradicted (high bleeding risk), temporary low-dose prophylactic anticoagulation should be strongly considered. Dr. Piovella completed her medical Internship, Residency, and Fellowship in Internal Medicine at the I.R.C.C.S Policlinico San Matteo in Pavia, Italy. She worked as a fellow in the Thromboembolic Disease Unit of Policlinico San Matteo in Pavia. Her major research effort this past year has been related to heparin-induced thrombocytopenia. Dr. Piovella is currently a Venous Thromboembolism Research Group Fellow. 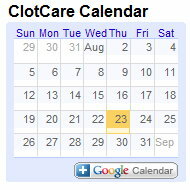 This posting originally appeared on the website of the North American Thrombosis Forum (NATF) and has been provided on ClotCare with NATF's permission. See www.natfonline.org for more information about NATF.